The Tchaikovsky Hostel Split is a warm and friendly boutique hostel that welcomes travelers from all over the world. 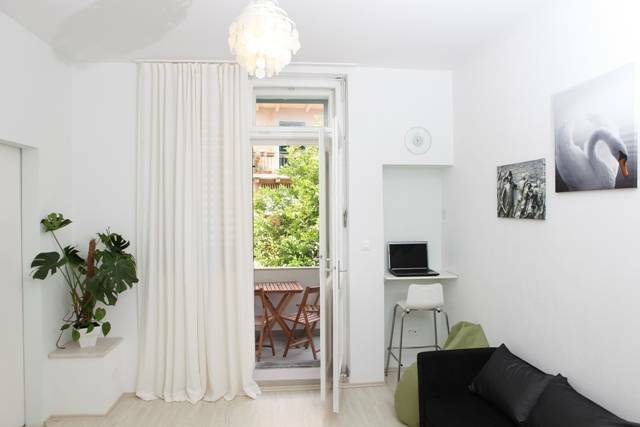 It is located downtown, just a few meters from the City Theater and the famous Diocletian palace. Everything that Split offers is right under your nose: restaurants, bars, shops, sights, galleries and much more. Tchaikovsky Hostel Split has two dorm types available - with 4 & 6 beds and can accommodate up to 20 people. Our rooms are air conditioned and equipped with bunk beds. Each bed has its own night light, shelves, electric socket and an own curtain which ensures more privacy for each guest. Individual lockers, bed sheets and linen are provided in the room without charge. Common bathroom facilities are accessible through the corridor. Tchaikovsky Hostel Split is located downtown, just a few meters from the City Theater and the famous Diocletian palace. Everything that Split offers is only a stone's throw away: restaurants, bars, shops, sights, galleries and much more. The seafront, the harbor, beaches, the soccer stadium, the concert arena, the beautiful Forest Park Marjan and the main attractions of Split are just a few walking minutes away. These attractions include the old town and Diocletians palace, the Mestrovic gallery, the Cathedral (Roman Mausoleum), Ethnographic and City Museum and much more. Tchaikovsky Hostel Split makes a great base for exploring the city. Tourist Tax in Split is 7 kn per person, per night. This charge will be added to the total charge upon arrival. Cancellation is possible 2 days (48 hours) prior to arrival without charge. cancel in advance), the guests credit card will be charged the first night’s total charge. By Car: When you enter Split, you are driving along the 'Zbora narodne garde' Street. Turn right into the 'Domovinskog rata' Street and drive about 3 km towards town center. When you see a big advertisement poster on a building frontage and a bus station on your right side, at that point you have to turn right into the 'Gundulićeva' Street. You drive 600 m and at the cross road with a traffic light you turn left. Then you should see a car park and a soccer court. Here you can leave your car and look for the 'P. I. Čajkovski' Street. It is a walking zone beside the car park and the 'P. I. Čajkovskog' Street begins at the lottery stand near by. If you use a navigation system, you can type in the Address 'Svačićeva 10'. The Tchaikovsky Street begins just in front of the Svačićeva Street No. 10. Because it is a walking zone, the navigation systems sometimes can not find our Street, that is why you should search for Svačićeva Street No. 10. From the airport: From the Split Airport to the Tchaikovsky Hostel it is about 24 km by car and it takes about 30-40 minutes. You have shuttle buses from there or you can take a cab. From the main bus station/train station/ferry station: You walk along the seaside towards the town center. You continue walking along the main sea promenade until you see the hotel Bellevue with a fountain in front. There you turn right into the Bana Josipa Jelacica Street and continue walking. You pass the reception of hotel Bellevue, then comes a bakery, then the pizzeria Galija, an ice cream shop 'Hajduk', then a bank. At that point you will see a yellow building in front of you, which is the national theater. You pass the backside of the theater and you will see a few bars in front of you. You pass the Nostradamus bar, Pizza Cut and at the lottery kiosk you turn right into the Cajkovski Street. We are in No. 4. It should take you approx 20 min to reach us. If you are arriving from the northern side (not the seaside), close to our hostel is a hotel named 'Hotel President'. If you happen to be at the hotel, just walk south towards the National Theater or better said the direction towards the sea (down the Svaciceva Street). Turn the second street right (not counting the cross road at the hotel President) and you will be in the Tchaikovsky Street. The street is a walking zone and starts just in front of the restaurant Index. Note: When you arrive at the building, press the buzzer and push the door at the same time to open! The button activates the door-opening automatically. As we are located in town center the main bus and train station, the ferry station and several taxi stands are close to the hostel.